On the outbreak of the First World War in 1914 Fritz Haber, the talented chemist, offered his services to the German Army. He began experimenting with chlorine gas to be used in Trench Warfare. His wife, Clara Haber disagreed that he should use his talents in this way. She later committed suicide in protest against his work. The German Army first used chlorine gas cylinders in April 1915 against the French Army at Ypres. French soldiers reported seeing yellow-green clouds drifting slowly towards the Allied trenches. They also noticed its distinctive smell which was like a mixture of pineapple and pepper. At first the French officers assumed that the German infantry were advancing behind a smoke screen and orders were given to prepare for an armed attack. When the gas arrived at the Allied front-trenches soldiers began to complain about pains in the chests and a burning sensation in their throats. Most soldiers now realised they were being gassed and many ran as fast as they could away from the scene. An hour after the attack had started there was a four-mile gap in the Allied line. As the German soldiers were concerned about what the chlorine gas would do to them, they hesitated about moving forward in large numbers. This delayed attack enabled Canadian and British troops to retake the position before the Germans burst through the gap that the chlorine gas had created. Chlorine gas destroyed the respiratory organs of its victims and this led to a slow death by asphyxiation. One nurse described the death of one soldier who had been in the trenches during a chlorine gas attack. He was sitting on the bed, fighting for breath, his lips plum coloured. He was a magnificent young Canadian past all hope in the asphyxia of chlorine. I shall never forget the look in his eyes as he turned to me and gasped: I cant die! Is it possible that nothing can be done for me? It was a horrible death, but as hard as they tried, doctors were unable to find a way of successfully treating chlorine gas poisoning. John French, the commander of the British Expeditionary Force at Ypres later recalled: "The effect of the gas was so overwhelming that the whole of the positions occupied by the French divisions were rendered incapable of resistance. It was impossible at first to realise what had actually happened. Fumes and smoke were thrown into a stupor and after an hour the whole position had to be abandoned, together with 50 guns." It was important to have the right weather conditions before a gas attack could be made. When the British Army launched a gas attack on 25th September in 1915, the wind blew it back into the faces of the advancing troops. This problem was solved in 1916 when gas shells were produced for use with heavy artillery. This increased the army's range of attack and helped to protect their own troops when weather conditions were not completely ideal. After the first German chlorine gas attacks, Allied troops were supplied with masks of cotton pads that had been soaked in urine. It was found that the ammonia in the pad neutralized the chlorine. These pads were held over the face until the soldiers could escape from the poisonous fumes. Other soldiers preferred to use handkerchiefs, a sock, a flannel body-belt, dampened with a solution of bicarbonate of soda, and tied across the mouth and nose until the gas passed over. Soldiers found it difficult to fight like this and attempts were made to develop a better means of protecting men against gas attacks. 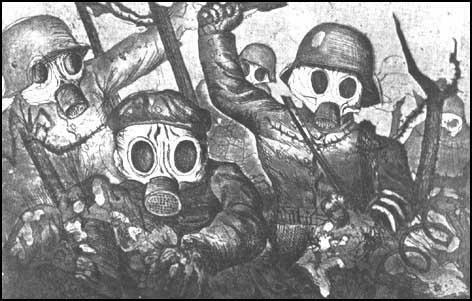 By July 1915 soldiers were given efficient gas masks and anti-asphyxiation respirators. One disadvantage for the side that launched chlorine gas attacks was that it made the victim cough and therefore limited his intake of the poison. Both sides found that phosgene was more effective than chlorine. Only a small amount was needed to make it impossible for the soldier to keep fighting. It also killed its victim within 48 hours of the attack. Advancing armies also used a mixture of chlorine and phosgene called 'white star'. (1) Private W. Hay of the Royal Scots arrived in Ypres just after the chlorine gas attack on 22nd April 1915. We knew there was something was wrong. We started to march towards Ypres but we couldn't get past on the road with refugees coming down the road. We went along the railway line to Ypres and there were people, civilians and soldiers, lying along the roadside in a terrible state. We heard them say it was gas. We didn't know what the Hell gas was. When we got to Ypres we found a lot of Canadians lying there dead from gas the day before, poor devils, and it was quite a horrible sight for us young men. I was only twenty so it was quite traumatic and I've never forgotten nor ever will forget it. (2) After the chlorine gas attack at Ypres in 1915, Sir John French, commander of the British Expeditionary Force, explained what happened. The effect of the gas was so overwhelming that the whole of the positions occupied by the French divisions were rendered incapable of resistance. It was impossible at first to realise what had actually happened. Fumes and smoke were thrown into a stupor and after an hour the whole position had to be abandoned, together with 50 guns. The Germans set fire to a chemical product of sulphur chloride which they had placed in front of their own trenches, causing a thick yellow cloud to be blown towards the trenches of the French and Belgians. The cloud of smoke advanced like a yellow low wall, overcoming all those who breathed in poisonous fumes. The French were unable to see what they were doing or what was happening. The Germans then charged, driving the bewildered French back past their own trenches. Those who were enveloped by the fumes were not able to see each other half a yard apart. I have seen some of the wounded who were overcome by the sulphur fumes, and they were progressing favourably. The effect of the sulphur appears to be only temporary. The after-effects seem to be a bad swelling of the eyes, but the sight is not damaged. The French soldiers were naturally taken by surprise. Some got away in time, but many, alas! not understanding the new danger, were not so fortunate, and were overcome by the fumes and died poisoned. Among those who escaped nearly all cough and spit blood, the chlorine-attacking the mucous membrane. The dead were turned black at once. About 15 minutes after letting the gas escape the Germans got out of their trenches. Some of them were sent on in advance, with masks over their heads, to ascertain if the air had become breathable. Having discovered that they could advance, they arrived in large numbers in the area on which the gas had spread itself some minutes before, and took possession of the arms of the dead men. They made no prisoners. Whenever they saw a soldier whom the fumes had not quite killed they snatched away his rifle and advised him to lie down "to die better". Dusk was falling when from the German trenches in front of the French line rose that strange green cloud of death. The light north-easterly breeze wafted it toward them, and in a moment death had them by the throat. One cannot blame them that they broke and fled. In the gathering dark of that awful night they fought with the terror, running blindly in the gas-cloud, and dropping with breasts heaving in agony and the slow poison of suffocation mantling their dark faces. Hundreds of them fell and died; others lay helpless, froth upon their agonized lips and their racked bodies powerfully sick, with tearing nausea at short intervals. They too would die later - a slow and lingering death of agony unspeakable. The whole air was tainted with the acrid smell of chlorine that caught at the back of men's throats and filled their mouths with its metallic taste. (6) Lance Sergeant Elmer Cotton, described the effects of chlorine gas in 1915. It produces a flooding of the lungs - it is an equivalent death to drowning only on dry land. The effects are these - a splitting headache and terrific thirst (to drink water is instant death), a knife edge of pain in the lungs and the coughing up of a greenish froth off the stomach and the lungs, ending finally in insensibility and death. The colour of the skin from white turns a greenish black and yellow, the colour protrudes and the eyes assume a glassy stare. It is a fiendish death to die.